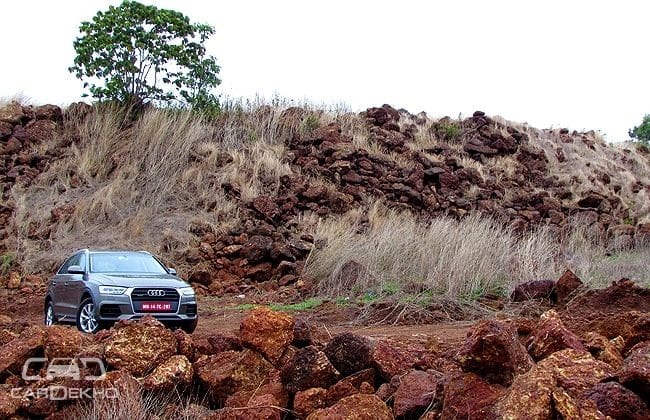 The Audi Q3, since its arrival, has been ruling the premium compact SUV space in India. Good looks, frugal diesel engine and aggressive pricing, made it a runaway hit and now in the newest avatar, it promises to continue the dominance. We just had a go in one on the beautiful streets of Goa to find out how it actually fairs. First of all, it’s not a new car but a mid-life facelift, hence the changes aren’t that drastic. With the Q3 facelift, Audi is introducing their new ‘Q’ family face, which looks quite truculent than the earlier design. The hexagonal front radiator grille has become wider and the upper sides of which now merge with a new set of turn signal-integrated LED headlamp unit. The overhead wing that connects the grille and the headlight is aluminium finished instead of generally-used chrome, providing a very sophisticated look while avoiding the extra bling. The air dams and the lower grille with a chrome lining add on to the overall sporty design of this baby SUV. Around the side and even on the rear, facelifted Q3 remains almost identical to the earlier model, though a new bumper, refreshed LED taillights and tweaked side skirt come as some of the evident changes. A new design 17-inch alloy wheels and three new colour options- red, blue and brown, have also been added to the 2015 Q3. Step inside and a plusher cabin welcomes you. The dual-tone black and beige upholstery, as seen in the image above, and an-all black upholstery are the options offered on the inside. The wood inserts on the earlier Q3 have now been replaced with the aluminium-finished panels, giving a very upmarket feel. Material quality as well the fit & finish has also improved. The seats are comfortable and can be adjusted electrically in a lot of ways to provide the best possible position to the occupant. The rear seats too offer great lumbar and under thigh support. Under the front centre hand rest, there is a storage area boasting decent space, mobile charger and USB slot. The MMI infotainment system, which is already being offered on many Audis, also makes way to Q3. A large panoramic roof and sunroof with an electric sunblind comes as standard on the top-end variant, which we drove. Internationally, the Q3 comes with several engine options, but we only got a 2.0-litre diesel engine here in India. And the story with the facelift hasn’t also changed. The performance and efficiency of this tried & tested oil burner remains the same and puts out 174 bhp along with 380 Nm of peak torque from as low as 1,750rpm. After a bit of turbo lag, the unit picks up quite well. The only difference that is on offer here, are the paddle shifters, which came as a surprise and rather a fantastic one. These let you go through the gears much quicker on the precise seven-speed dual clutch gearbox, while Audi’s all-wheel-drive Quattro drivetrain comes as an icing on the cake. The Audi Drive Select offers two modes- Dynamic and comfort, and changes the gearbox, steering and suspension settings based on the road condition and your driving mood. Though, switching modes isn’t as dramatic as it feels in bigger offerings from Audi’s stable. Like any other Audi, the Q3 also offers an impressive ride quality. In the Comfort driving mode, the suspension setup shifts towards the softer side and glides easily over our patchy roads, though a bit of body roll is experienced in the cabin. While the Dynamic mode stiffens the scene a bit, but the real soft-roader character of this SUV remains intact. The Q3 does suffer a few handling issues while driven enthusiastically, chief among which are light steering and lesser damping feedback. However, these also act as a boon in the normal urban driving conditions. The Q3 has always been the best all-round package in its segment and the facelifted model takes the game a step forward. Its plush, well equipped and styling quotient has also definitely gone up, especially with the new LED lamps and aluminium garnishing. There is certainly an improvement in almost every possible aspect and it concludes to be a fun compact SUV to drive, though the handling still has space for improvement. Now, with these updates on-board, the refreshed Q3 should have no trouble in reigning supreme in the premium compact SUV segment.